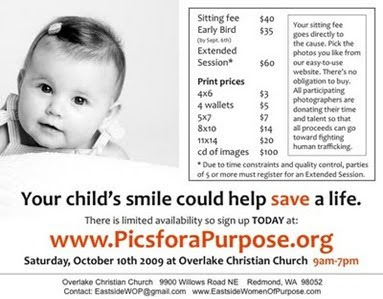 Our Eastside Women of Purpose group is having our 2nd Annual Pictures for a Purpose on Saturday, October 10th. If you're local, go to our WEBSITE and sign up to have your child's picture taken (if you register now, you will receive an Early Bird Discount as well as a prime slot with the photographer of your choice!). 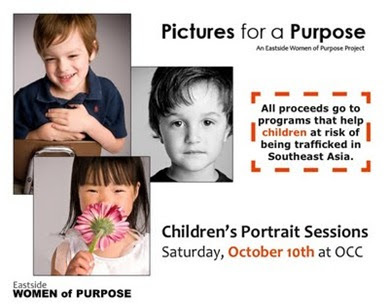 All of the sitting fees and a majority of the cost of prints go directly to STOPPING child trafficking. Six, amazingly talented local photographers donate their entire day, talent and equipment to this important cause.